Sims Cattle Co. sits in the Rock Creek Valley at the foot of the Snowy Mountain Range, west of Laramie, Wyoming, and 200 miles north of Denver. Elk Mountain rises 11,000 feet in the distance. Sims cattle graze at 7,200 feet, and no month has gone without snow. Annual rainfall is 16 inches, most falling in April, May and June. The growing season is advertised at 60 days but is often as few as 45. Winters won’t disappoint even the foulest of predictions. Yet, the Sims operation is tuned to function as an ecologically sustainable unit in this turbulent climate. “That means high-intensity, short-duration grazing, full-season grazing deferment on one-third of our upland range and the elimination of chemical inputs to the soil,” says Shanon Sims, who manages the operation with his wife, Melinda, and his father and mother, Scott and April. Flood-irrigated hay meadows produce 1,500 tons of forage in a year. Pastures offer a diverse diet. Delicate Indian ricegrass and bluebunch wheatgrass are welcome barometers of the Sims’s sound management. Junegrass offers abundant early-season protein important to the calving program. Western wheatgrass is a valuable summer grass as the herd packs on weight before winter. “We want to raise good grass and harvest it with whatever means is most economical for us,” Melinda explains. That might be by bales — although that isn’t economical now — or by sheep, which the Simses tried without success. But, cows work. “We’re converting sunlight into a sellable product. The cows are fat and happy on all the grass we’ve grown this year,” she says. That hasn’t happened by luck. “Mismanaging livestock will rapidly destroy ecosystems that have required millennia to establish,” Shanon says. The animals graze 140 pastures for six months, from one to 14 days, each. No pasture is grazed more than one time during a season. Some get as many as 800 days of rest. The herd grazes for four months on windrowed hay and two months on baled hay. “Our strategy for building this business also can be boiled down to one word — sustainability,” Shanon says. By that measure, the family managers of Sims Cattle Co. manage the business to function debt free — to take on debt only when necessary, not because the business functions only with debt. The Simses made important changes. The ranch reduced its reliance on fossil fuels. The family eliminated the use of chemical inputs and downsized their machinery line. Over a two-year period, Sims Cattle went from net losses to a six-digit profit. By 2012, they were able to operate the entire year on their own money. By 2017, the Simses set up a rainy-day account holding one year’s worth of business expenses. They radically changed their cattle-management practices. Steer calves were sold in the fall instead of going to a winter feedlot. The family found value in selling nonbreeding females as stockers. The Simses resolved to move their calving date further into weeks of the spring to reduce the cost of supplemental feed. Calving moved from April 1 to the May 1 with cows bred in a tight window beginning the previous July. “It’s allowed us to reduce the supplemental feed needed to meet the cow’s requirements during lactation,” Shanon explains. The grass greens up by May 10, and, by May 25, the cows and their calves are turned out completely on grass. One important idea about developing heifers took shape during the ranch’s innovative strategy meetings. Melinda came across research showing benefit from keeping heifer calves on their mothers through the end of February instead of weaning them in October. “A cow’s rumen doesn’t fully develop until she is about 10 months of age,” Melinda says. “So, they really need that butterfat to create a good grazing animal. That’s what we are trying to do to, create a good grazing animal.” Sims cows are 50% Angus, one-quarter Gelbvieh and one-quarter Simmental. The cow/calf management changes have paid off. In 2014, Sims Cattle spent $98,000 developing replacement heifers in a feedlot and $65,000 purchasing feed for the herd at home. In 2017, they incurred no feedlot expense and spent $25,000 on purchased feed. 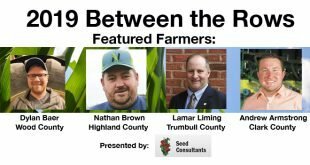 This is the third of five profiles of our ninth class of DTN/The Progressive Farmer’s America’s Best Young Farmers and Ranchers. They represent the future of agriculture through their sense of tradition, use of new technology and business acumen.